Rohwit – your translation is incorrect. In Persian “Tu man shodi” means You became me and “Man tu shodam” means “I became you” not “yours”. “Man” means “I” not “mine”. “I became yours” is “Man maal-e-to shodam”. Also how, how could you not love the Tum Tak song!! Javed’s voice is absolutely magical – the lyrics are beautiful. My only crib is that ARR creates a beautiful song and then decides to spice things up by inserting a musical digression in the middle that is jarring. Anthead – Really sorry for the wrong translation. Shall get the correct one accomodated. Baaki, I dont like tum tak for the reasons mentioned above 🙂 Glad you disagree. No worries – glad to be service-y. Love your review, even though we disagree :). The use of shehnai is amazing – ARR truly captures the essence and ethos of Banaras in this album – you’d think he was a Chhora Ganga kinare wala in some past life :). ” Jagegi phir kismat sone ” ( raanjhana title track ) iska matbal kya hai. As for Shehnai, nothing comes close to ‘The Dichotomy of Fame’ from Rockstar. no. ye jo des hai meta has the best shehnai piece in the end. umm yes, how could i forget! Okay, am i the only one for believing Amit Trivedi uses Sitar better than AR Rahman ?? Isn’t it great to have an album which has a predominant semi-classical appeal. Especially because it’s in the hands of a music director who has a penchant for trying something new. 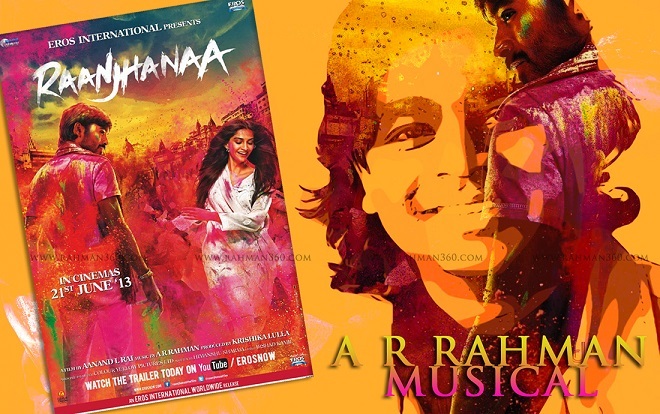 It is refreshing to hear Rahman experiment with classical instruments and not get carried away in creating a new sound. Having said that I don’t like aye sakhi.. Which is lost between silly and funny. To me, tum tak, the title song, Nazar laye, tu man shudi are instant hits and have enough to the album into the years best. Aise na Dekho is signature Rahman vocals but seems to reminiscent of jaane tu ya jaane na. Piya Milenge has something haunting about it that might grow eventually. Surprisingly there isn’t one clear favorite from a vocal point of view. Usually Rahman albums have one clear vocal highlight. They are all equally good (or average, I fear). No clear winner – Aptly put. Majorly agree with you man. “Rabbi (No no, not the Rabbi who sang Challa, this one sings better! )” – I thought Rabbi Shergill sang both Challa & Tun Mun Shudhi….confused?? You have spelt Anwesha Datta as “Amweesha”. Please Correct it 🙂 ! I am glad that so many people enjoyed the music of Ranjhana, proves once again the diversity of our musical preferences. Speaking entirely for me and no one else, I found the music of Ranjhana bland, an easy to listen but easier to forget bunch, sounded extremely middle of the road. It is as if Mr. Rahman has lost his mojo. Like Austin Powers maybe he needs to visit his past. Aha! Indranil please remember…the mojo that we felt addicted to was of ‘our times’ when rahman was new. I feel he is reinventing himself with everything or at least trying to. Do keep in mind that this is a soundtrack in which he has given the feel of the film as well. Lots of variables my friend. Nazar Laaye – This is one of the gems out of the list for me.. So “Rehna Tu”. Rashid Ali’s vocals romantic to the core, pampering your ear drums.. Lyrics, Top notch. I say, this is the kinda song, you would hardly skip even after years.. unlike the title song or Tum Tak, that you’ll get tired of.